Foreign governments are stepping up the evacuation of their citizens from Lebanon, as Israeli warplanes carry out a seventh day of air strikes. France and Italy have shipped 1,600 Europeans to Cyprus, and UK warships are set to move thousands of Britons. The UN has warned of a humanitarian disaster as Lebanese flee their homes. In Israel's latest strikes, 11 Lebanese soldiers were killed at a barracks near Beirut. Hezbollah has continued to fire volleys of rockets across the border. Israel launched its assault and blockade after Hezbollah fighters captured two of its soldiers last Wednesday. Twenty-four Israelis have died - 12 civilians and 12 members of the military. Her comments came as tens of thousands of foreigners were set to leave Lebanon by land, sea, and air. On Tuesday morning, a ferry chartered by France took 1,200 Europeans to Cyprus. Nearly 400 people arrived on an Italian navy vessel on Monday night. A pregnant woman coming ashore described the last few days as being "the most disgusting and the most frightening of my life". British warships are standing by to transport up to 12,000 Britons and a further 10,000 people with dual British-Lebanese nationality to Cyprus. US military helicopters have started flying Americans to Cyprus, and a commercial ship is due to move another 25,000 people to safety. Canada has also chartered ships, while other governments are organising pullouts by land to Syria. As the cross-border exchanges of fire continued, six bodies were pulled from the rubble of a home in the Lebanese border village of Aitaroun, and another family was killed in the coastal city of Tyre. 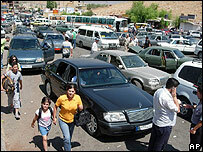 The BBC's Jim Muir in southern Lebanon says the roads are clogged with packed vehicles as people flee. The UN's top humanitarian official, Jan Egeland, said air strikes on roads and bridges were hampering efforts to help them. "It's already very bad, and it is deteriorating by the hour," he told the BBC. Lebanon's pro-Syrian President Emile Lahoud has vowed to stand by Hezbollah leader Sayyed Hassan Nasrallah. "Rest assured Lebanon will not remove Sayyed Nasrallah," he told a crowd. "[He], the resistance and the national army achieved liberation for Lebanon. We will not forget that." The father of one of the missing Israeli soldiers said he hoped all means - legal or illegal - would be used to get his son back. Shlomo Goldwasser's son Ehud was captured last Wednesday in the Hezbollah cross-border raid which sparked the crisis. As efforts continue to find a diplomatic solution, UN Secretary General Kofi Annan said he expected European nations to contribute troops to a proposed stabilisation force to end the fighting. "It is urgent that the international community acts to make a difference on the ground," Mr Annan told reporters in Brussels.